Icy, snowy and freezing weather raise the chances of injuries to workers – and not only from traffic accidents. Slips and falls are among the most severe work-related hazards during the winter. These hazards are present just about anywhere, and you don’t have to be working outside to suffer a slip-and -fall accident. 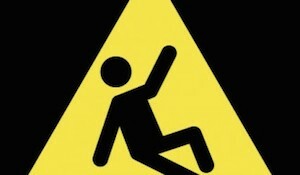 A slip-and-fall hazard can exist in a parking lot or sidewalk that is covered with snow or ice. Slips and falls also can occur just inside a building’s entrance, where people may have tracked in snow and ice. To prevent this, put nonskid rugs inside doorways. Place warning signs around wet areas. Severe weather can also raise the risk of cold stress, hypothermia and frostbite, particularly for workers in areas that do not have adequate heating or insulation. People who must work in such conditions should dress warmly. First aid kits, hand warmers and blankets should be available for all workers. Workers who are assigned to shovel snow run the risk of back and musculoskeletal injuries. Workers who are shoveling snow should take breaks, perform light stretching exercises before shoveling, and use shovels that reduce the need to bend steeply or frequently. Employers must keep in mind that shoveling is a strenuous activity and can increase cardiovascular stress. Workers also need to be trained properly to use snow-blowing machines; unfamiliarity with these devices can increase the risk of finger amputations and lacerations. Use safety shields and safety guards for protection while using snow blowers. Employers need to take hanging weather conditions into account and help employees prepare for. It’s a good idea for employers to implement training programs to educate workers about the specific risks that they will be facing in winter.